1 fl. oz. 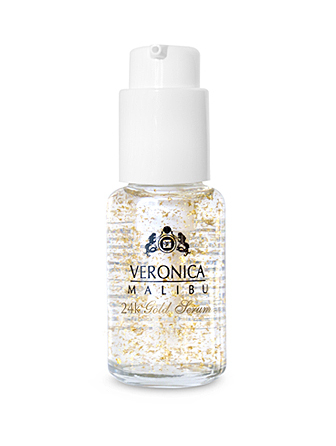 – This Serum combines pure 24 K Gold with the power of antioxidants, botanicals and essential oils to strengthen skin’s elasticity and firmness, while providing superior hydration and smoothness. This combination improves circulation and decreases skin inflammation, which helps to improve the appearance of expression line, fine wrinkles and age spots. By decreasing skin inflammation, pure gold helps to improve the appearance of fine lines, wrinkles and age spots. Makes an ideal makeup primer that creates a smooth surface for application. Can be added directly into facial creams and body lotions to help boost product performance by adding brightening and skin softening aromatherapy benefits. Cyclomethicone, Sweet Almond Oil, Caprylic/Capric Triglyceride, Evening Primrose Oil, Dimethicone, Jojoba Oil, Apricot Kernal Oil, 24K Gold, Tocopheryl Acetate, Ascorbyl Palmitate, Retinyl Palmitate, Squalene, Neroli Essential Oil, Roman Chamomile Essential Oil. Apply a pearl drop amount directly to the skin twice a day, gently massage in the gold in circular movements on face, neck and décollete until fully dissolved. Recommended for all non-problem skin types. Caution: Avoid contact with eyes and mucous membranes. Keep out of the reach of children. Use only as directed.